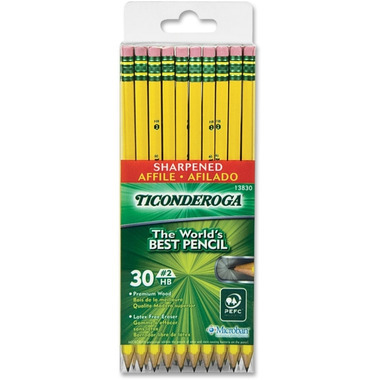 Ticonderoga Pre-Sharpened No. 2 Pencils come ready to use. Each pencil is crafted from reforested premium cedar wood for easy sharpening. The satin smooth finish enhances writing comfort nd the exclusive graphite-core formula gives you an extra-smooth performance. With a top-quality, latex-free eraser that delivers easy, clean corrections.